Pretzel Logic's Market Charts and Analysis: Wyndham Worldwide: Potential Short Opportunity? Wyndham Worldwide: Potential Short Opportunity? In examining my chartbook this weekend, I came across this possible short opportunity. This is Wyndham Worldwide, a resort/timeshare company. The stock appears to have just completed an ending diagonal. In classic TA, this would be known as a "bearish rising wedge." 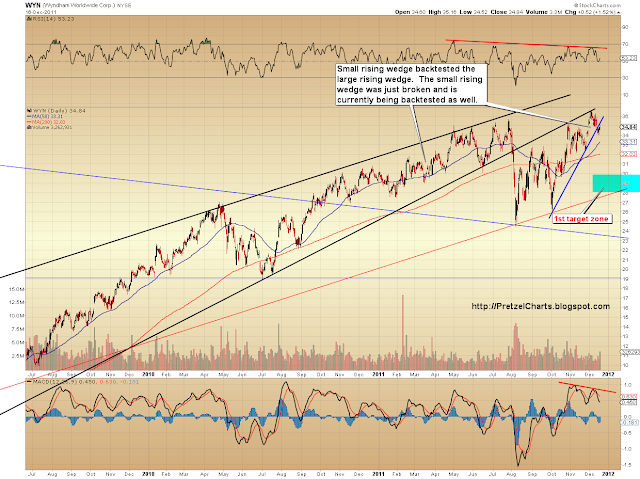 We can see that the wedge has been broken and backtested from underneath, which is also a bearish signal. Wyndham Worldwide was a fantastic short play in 2007-2008 when, in the span of 16 months, it dropped from $36.50 all the way down to $2.38. It subsequently rallied to its recent high of $36.60. 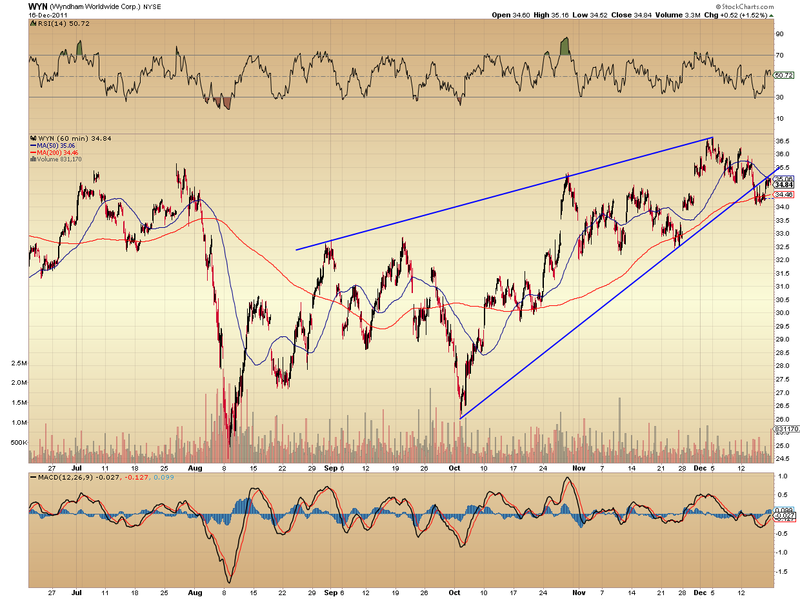 Besides the chart, what indicates Wyndham could be a solid short play? For those who are interested in fundamentals: Wyndham is a spin-off of the old Cendant Corporation. Wyndham's primary sources of revenue are its vacation-related business divisions. Wyndham is the world's largest hotel franchisor, the world's largest timeshare-exchange network (the RCI division), and the world's largest vacation ownership (timeshare) company. I expect these businesses, especially timeshare, to get hit hard in the current/coming recession. During 2008, Wyndham's timeshare sales took a haircut to the tune of roughly 40%, with most of that loss coming after the mid-point in the year as the stock market deteriorated. Timeshare is becoming a dead business model anyway, for two reasons: 1) the real estate market has collapsed, and 2) use of the internet has become widespread. It's hard to sell a "brand-new" timeshare when someone can go on eBay and buy the exact same timeshare for pennies on the dollar. Additionally, the timeshare division ("Wyndham Vacation Ownership") writes much of their own paper. It seems probable they are holding onto a good chunk of marginal paper, plenty of which is sure to be at risk for default -- especially since the only thing people "lose" when their timeshare gets foreclosed is the right to use said timeshare. There's no repo man who shows up and rips "a week" out of the building while the wife is crying and the kids are clutching their beach towels, screaming, "But Daddy, where will we vacation now?" so it's not terribly traumatic. Many owners are certain to see default as preferrable to continuing to pay their monthly loan and maintenance fees. Maintenance fees alone on the average Wyndham timeshare are about $70 per month. If you owned a mortgaged timeshare and had to prioritize where to allot your dwindling money in a depression, the timeshare would likely be the first payment to go. Thanks Pretz for the headsup. Trading in the cash market as I learn the ropes. This will help. Great catch....I'd like to dare and take this short, to gain a little experience; I realize you are not making a recommendation and we are on our own. Would you be able to give us a count on the daily and hourly charts. I assume the pattern is A_B_C and we are coming down from B, as in SPX. What would be a good entry point? Like several other times over last 6 weeks, I see you once again have picked up the ball and run with one of MY ideas, idea that I once again re-stated last week, after mentioning it several times a month ago----betting against amerikan real estate stock OVERpricing, through it's new homebuilder large corporations. However, from what I see on the charts and fundamentals listed above, you have found an even better and bigger potential downside r.e. management loser, than any I already have, in MY usual suspects---LEN, TOL, PHM, DHI. So you did a good job in upping MY usa r.e. OVERpriced-stock ante, by providing ME this plump christmas goose WYM; as I totally concur with you here, usa 'timeshares' will be CRUSHED, in the upcoming depressionary crash. As such, I am going add puts bigtime against this plumper juicer turkey, just as soon as I study the charts MY way, and locate MY entry points, over this week's time. Because, for this upcoming trading week, I have been looking at several things over the weekend, and I see a strong potential for more sideways action with a upward bias, breaking your downward parallel trend channel, but NOT breaking any of the 5 MAJOR resistances I have already cited---though they will be retested. I'll wrote further about this on your primary spx post above. MY bubble, you fool? You are MY maui clown. Reread what I wrote, EXACTLY. Has nothing to do with what you observe, or not. OF COURSE I know this stock is one you have tread, awhile. yet---that has nothing to do with what I EXACTLY wrote. You have repeatedly used MY ideas, and/or phraseology, and you know it, beatch. And I have no problem, because I USE your ew pseudoshit, yet---you never acknowledge. You know WHY? Because you have an insane messiahnic PRETENTION, instilled from birth. Not sure what you're saying about how this article about WYN uses your ideas -- but I'm sure you do, and that's really all that matters. dude, wtf is wrong with you? you must have a chemical imbalance.